Aristotle is an angry teen with a brother in prison. Dante is a know-it-all who has an unusual way of looking at the world. When they meet at the swimming pool, they seem to have nothing in common. But as the two loners start spending time together, they discover that they share a special kind of friendship--the kind of friendship that changes lives and lasts a lifetime. 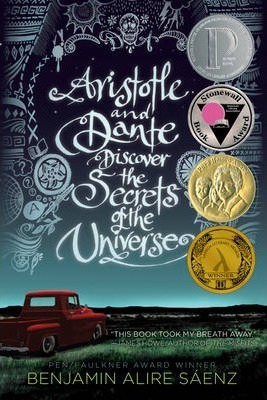 And it is through their friendship that Ari and Dante will learn the most important truths about themselves--and about the kind of people they want to be. Benjamin Alire Saenz is an American Book Award-winning author of poetry and prose for adults and teens. His first novel for young adults, Sammy and Juliana in Hollywood was an ALA Top Ten Book for Young Adults and a finalist for the Los Angeles Times Book Prize. His second novel for teens, He Forgot to Say Goodbye won the Tomas Rivera Mexican American Children's Book Award and the Southwest Books Award (Border Regional Librarians Association) and was a New York Public Library Book for the Teen Age. A former Wallace E. Stegner Fellow in poetry, Saenz is a professor in the creative writing department at University of Texas, El Paso.